Our last visit to Walt Disney World (from the UK) was in May 2010. After many years of visits to the World, we realised we had only ever eaten in Counter Service restaurants, and so decided to take the plunge and try the Trails End Buffet this time, having read many good reports about it! We were not on the Dining Plan, so this would be paid for out of pocket. 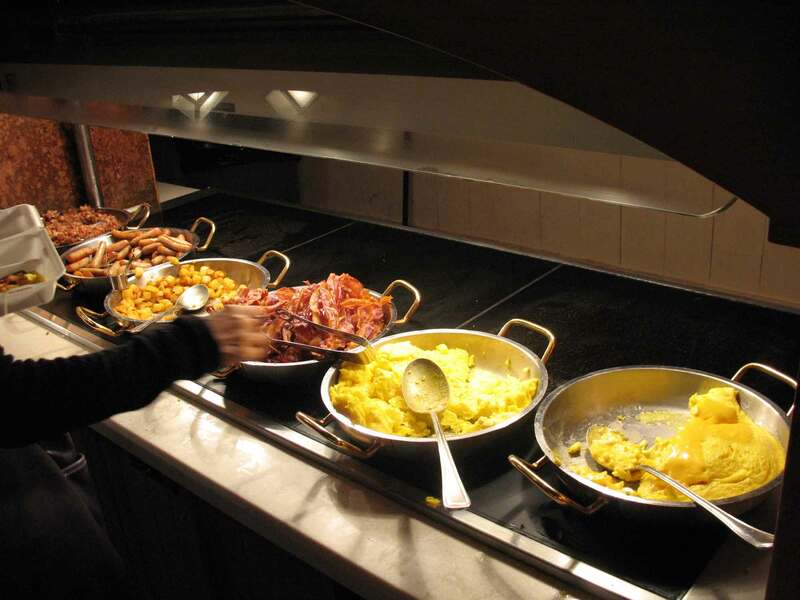 Breakfast buffet food at Trails End Restaurant at Fort Wilderness. Charlie and I arrived at Pop Century, our ‘home’ for the next week, quite late in the afternoon on Thursday, May 13, 2010, checked in, unpacked, grabbed a couple of refillable mugs, and headed on out to find Trails End. 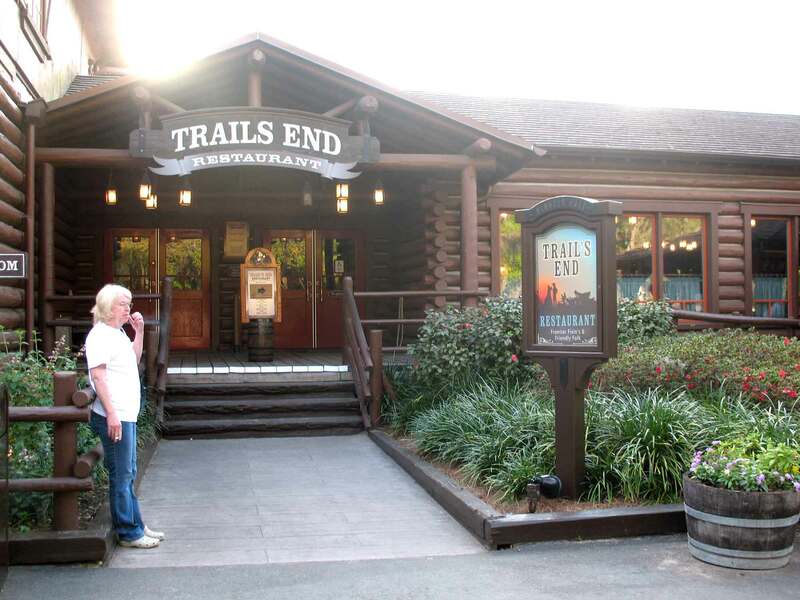 Following the direction signs, we drove to Fort Wilderness Campground, as we had a reservation at 7:30 p.m. As this was to be our very first meal in a Disney restaurant other than a fast food place, we were really looking forward to this. I had made a reservation there 180 days previously with the on-line reservation service, which had proved very easy to use. On arrival at the Campground, we parked the car and waited for a shuttle bus to take us to the far end, where the restaurant is located. One came along within five minutes, and we really enjoyed the next part of the journey, agreeing that it looks like a lovely place to camp. When we got off the bus, we still had a little while before our reservation time, so we had a wander around a couple of kiosks and looked at the pins etc., before checking in at the podium. We were given our very first pager, which we spent a few minutes admiring, before going to sit on some rocking chairs on the porch. We were loving this! We only had about a 10 minute wait before the pager went off in a display of sparkly flashing lights, and we were shown indoors to our table. First impressions were very positive, we liked the look of this place a lot! We sat for a few minutes before our server came over to us. She did seem somewhat terse with us, but we took no notice and ordered two adult buffets and two glasses of Sprite. She told us to help ourselves from the buffet, and while we were gone she left us glasses of iced water. We went up to the buffet – and I must say we were really impressed by the choice and quality of the food here. It was lovely! I had fried chicken, mashed potatoes, sweet corn, macaroni cheese and gravy to start with. Charlie got more or less the same as me, but also tried some other vegetables as well. We got back to the table and began our meal. Eventually, after a few minutes, the server finally turned up with the glasses of Sprite. We did think that she was maybe not feeling the Disney love, but we didn’t think much of this as we were not relying on her to bring our food to us, as we were serving ourselves anyway. The food was super-yummy, and we quickly went back for seconds! Having polished off the second plate, we then hit desserts – soft serve ice cream with a sprinkling of Reece’s Pieces for me, and a plate of brownies and mini pastries for Charlie. The whole thing was really lovely, and we would definitely go there again, feeling it was really good value for money. The only slight downside to this visit was our server – she had virtually ignored us all evening, and then as we were finishing desert, she attempted to whisk our plates away before we were completely finished. This is something Charlie hates, and it immediately put him on edge. Then she took away his glass of iced water without saying a word to him! We stared after her in disbelief, before he muttered something to me about ‘how rude’. She returned a minute or so later and slammed a fresh glass on the table by him, saying “I thought you were done with the water!” before turning and leaving again! She then brought the bill, and had the nerve to tell us that the gratuity wasn’t included on it. No, and it never was either, as we left the exact money and declined her invitation to leave her a tip! I have never done that before, but just felt that she was definitely lacking in basic manners, never mind Disney magic. Anyway, we decided not to let this upset us or ruin our visit, so we left the restaurant, and went back to one of the kiosks to get a Fort Wilderness pin for Charlie, before walking slowly down towards the beach area. We stopped for a quick look around a trading post type shop that we found, before a slow walk along the beach towards some loungers with very few people on them. We sat down on a couple of loungers and had a nap for half an hour! It was lovely, so relaxing. The temperature had dropped a little and we were comfortable without being cold. There were a few kids racing about on the beach, but nothing that kept us awake! Entry to the Trails End Restaurant at Settlement Outpost. It is next door to Pioneer Hall. At 9:45 the Electrical Water Pageant came past us, which was really sweet. Then, at 10:00 p.m., the Wishes fireworks show began at the Magic Kingdom, and the music and narration was piped in to our beach via hidden speakers. I had known that this would happen, and had planned it as our ‘something new to do at Disney’ for this trip. This was so romantic, and a lovely fitting end to our first day at Walt Disney World. Afterwards, we walked back to the bus stop, and caught a bus to the car park, before driving back to Pop Century. We stopped off at the food court to pick up coffee and hot chocolate in our mugs, then went back to our room to fall exhaustedly into bed at around midnight! Our overall impression of this restaurant was VERY favourable, and we enjoyed it very much. So much so that we have booked another two visits there when we return to Walt Disney World for two weeks in November this year, (free Dining Plan for the first time! ), and recommended it so highly to my family that they went there for the first time in September – I think they liked it! About the Author: Carolyn lives in the UK, first fell in love with Walt Disney World in 1989, and has visited 10 times since then, as well as 6 visits to Disneyland Paris. Her dream is to live in a fairytale castle with her handsome prince; failing that, regular visits to any Disney park anywhere in the world will do!